Markets are trading lightly today, with many institutions closing in observance of Martin Luther King, Jr. Day. 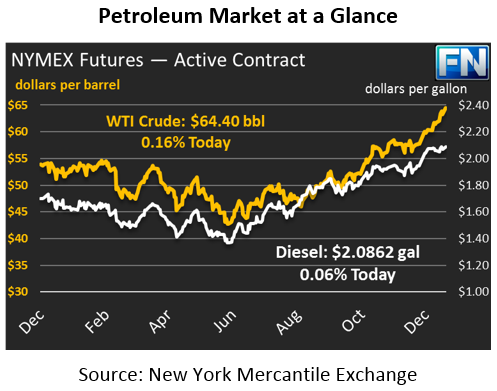 After a big up-and-down last week that saw prices fall from $64.50 $63.20 and back up, crude prices are currently trading just a few cents above Friday’s closing price, at $64.40. Refined products have seen equally narrow trading. Diesel prices ended the day Friday with small gains that boosted week-end gains to 2.5 cents. Gasoline saw larger increases, picking up 1.4 cents on Friday to end the week 4.6 cents higher than it started. Today, both products are virtually unchanged. Diesel prices are a mere 12 basis points above Friday’s close, trading at $2.0862. Gasoline has given up 0.2 cents, and is currently trading at $1.8480. Market moving news has been light over the weekend. Crude oil sentiment continues to be strongly bullish despite fundamentals suggesting a reversal. The CFTC reported that open interest in the market had reached new record highs, surpassing those highs seen in February 2017. 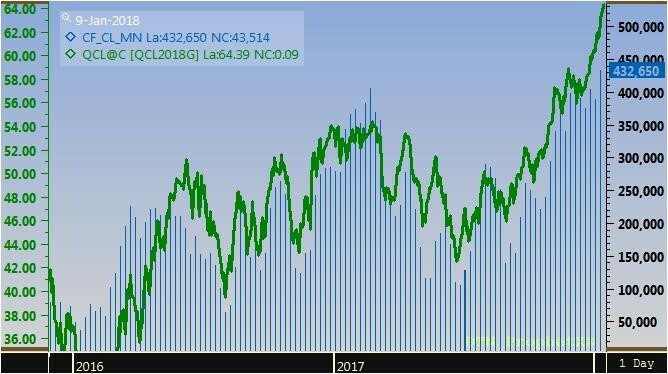 While market length has narrowly surpassed 2017’s highs, crude prices are significantly higher – in Feb 2017, WTI crude hovered near $53; this year they are $10 higher. We’ve reached price levels not seen in years, which has led analysts to adhere to technical support levels rather than fundamental news. Technical analysts point to $64.75 as the first level of resistance, followed by resistance at $67 and $71.